THE WESTERN Bulldogs will be sweating on the availability of experienced defender Dale Morris as they search for the match-ups to contain North Melbourne’s in-form tall forward line on Saturday. Morris was subbed out at three-quarter time of the Dogs’ loss to West Coast in Perth on Sunday due to chronic Achilles soreness, and leading medico Dr Peter Larkins believes he is in some doubt to face the Roos. 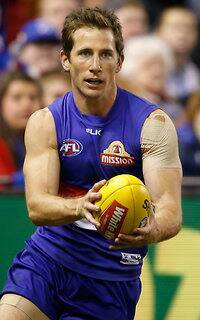 “He’s a veteran player so the Bulldogs looked after him and protected him,” Larkins told AFL.com.au. “I would’ve thought in a few days time he’s going to settle down and he’ll train later in the week. If Morris is ruled out, the Bulldogs will have to find opponents for North talls Drew Petrie, Jarrad Waite and Ben Brown as they look to break the Kangaroos’ seven-game winning streak. Meanwhile, Josh Caddy’s presence in the midfield over the next two weeks is pivotal if Geelong is to feature in September. Caddy has been battling knee tendinitis and it flared up in the first half of Saturday night’s game against St Kilda, forcing the Cats to sub him out of the game. Larkins said it was too early to tell whether Caddy would be available for Friday night’s clash with Colllingwood. “They need to get it (knee soreness) settled down before he can train fully later in the week,” Larkins said. Larkins expects Carlton captain Marc Murphy to miss the rest of the season after he dislocated his left shoulder in an attempted tackle on Melbourne’s James Harmes in the third quarter of Sunday’s game at the MCG. The star Blue is having scans on his shoulder on Monday. “He’s had reconstruction and fracture repair work through that shoulder before,” Larkins said. “It’s been a weak and vulnerable shoulder for him so when he dislocated it, he would’ve stirred up the old problems. Star Swan Lance Franklin should be fit to return for the club’s match against St Kilda on Sunday, according to Larkins. Franklin missed his third consecutive game with back tightness against the Giants on Saturday. “This week is likely to be the best of them,” Larkins said. “An assessment later in the week will determine it but this is the best he’s been by having the extra time off. – Tiger Ivan Maric and Bulldog Jarrad Grant, who both broke their noses at the weekend, should be fit for their respective matches. – Eagles ruckman Scott Lycett is unlikely to play again this year after injuring the posterior cruciate ligament in his knee in round 20. – Lycett’s teammate Sam Butler is not due back until the eve of finals as he continues to battle a hamstring strain. – Giants youngster Will Hoskin-Elliott could be ruled out for the year after injuring his right hamstring at the weekend. Scans on Monday will determine his fate. – Melbourne defender Heritier Lumumba had a bad lateral ligament sprain which will be scanned on Monday, putting him in doubt for Sunday’s game against Fremantle. – Gold Coast big man Sam Day was lucky to escape without any substantial neck damage, although he will face a fitness test before being declared fit for the Suns’ clash with Port Adelaide on Saturday.